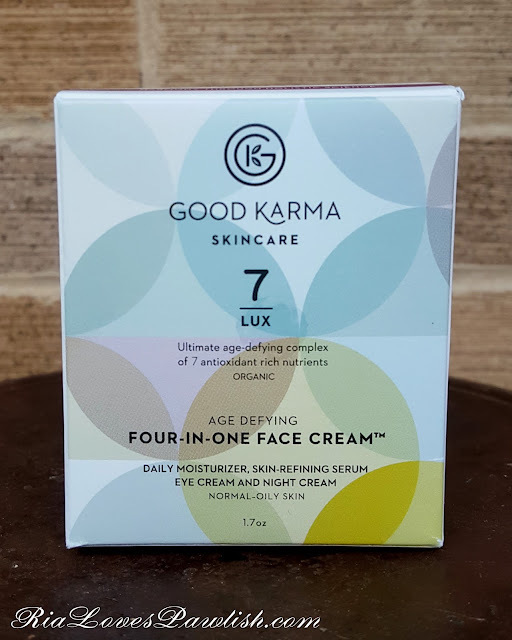 today's post is on Good Karma Skincare Lux 7 Four-In-One Face Cream for Normal To Oily Skin (press sample, kindly provided to me for review). i have been trying it out for over a month now, and i'm ready to tell you my thoughts! the outer packaging is simple, just a small box. the cream itself comes in a jar with a pump... but it's different than most pumps. the pump is like a button that takes up the entire top of the jar, with a small hole in the center that dispenses product. the pump is a bit difficult to control, but if you really hate it, you can simply unscrew that and use it exactly like a regular jar! to make this face cream Four-In-One, it is a daily moisturizer, eye cream, night cream, skin-refining serum. i found that for me, it worked best as a serum and night cream. i'm having some issues with my eyelids becoming quite sensitive, so i can't use this on my upper lid at all. even though this is the Normal To Oily Skin formulation, it's still extremely hydrating... which makes for gorgeous plump skin, but it's just too much for me during the summer for foundation to be able to stick to my face! i do use it on non-makeup days though, while it is of a thicker texture, it doesn't make skin look greasy or anything like that. the Four-In-One Face Cream really shines for me as a night cream and serum combined. it really keeps my skin hydrated and fresh looking... even though i use a high strength prescription retinoid nightly! while my skin looks lovely and plump and i have no problem heading out in public with no makeup, i did not notice a difference really in my fine lines... i feel like you would need more than a month to see results like that. 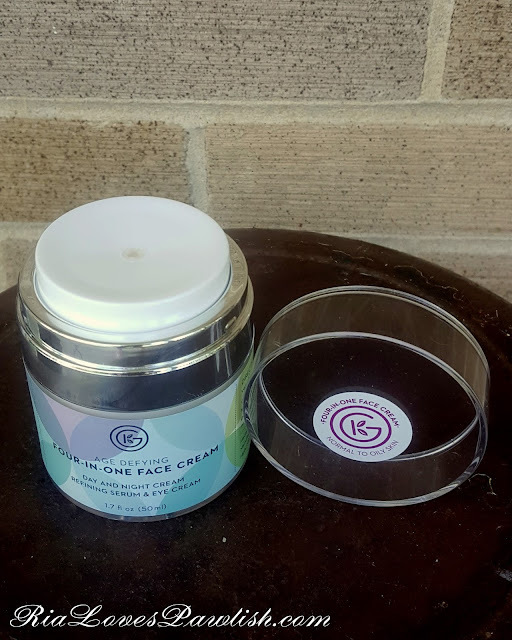 Good Karma Skincare Lux 7 Four-In-One Face Cream for Normal To Oily Skin retails for $48 and can be purchased at Good Karma Skincare's website HERE. you can also find the Normal To Dry version, and other skincare products!